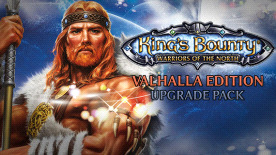 This product requires the base game Kings Bounty: Warriors of the North. Valhalla Armor Set: These unique in-game items are an armor set the hero can collect in the course of their journeys. Combined together these artifacts give additional a strong boost to the character’s attributes. Digital artwork and wallpapers. Digital bonuses: Ultra-high resolution artwork depicting an epic battle of Olaf and the Valkyries against undead hordes, and wallpapers available in all popular desktop resolutions.